William Howard Taft, 1857-1930. 27th President of the United States, 1909-1913; Chief Justice of the United States, 1921-1930. 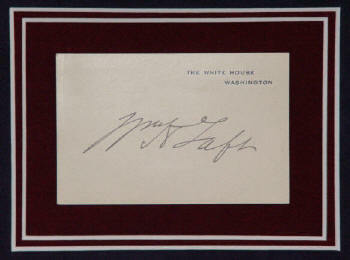 Pristine The White House card boldly signed, Wm H Taft, in black ink. 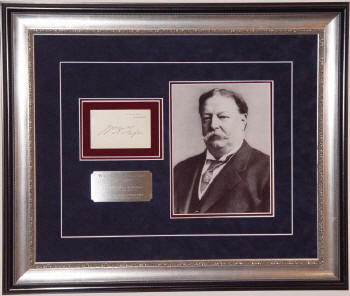 Taft is the only person ever to serve as both President and Chief Justice. 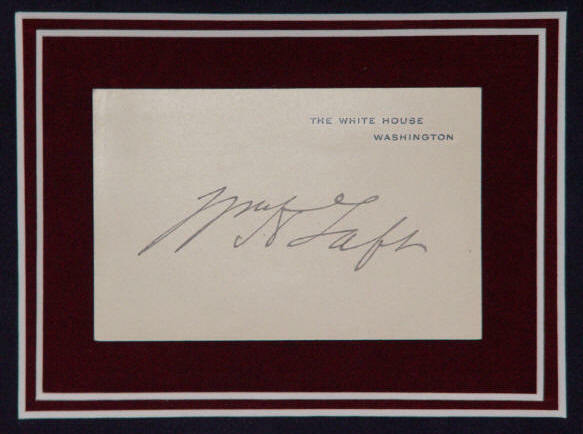 According to Lynne E. Keyes and Stephen Koschal in The History of Collecting Executive Mansion, White House, and The White House Cards (2005), cards such as this one, bearing only Taft's signature without either a sentiment or a date, are the most difficult to obtain. This piece is beautifully matted in marine blue and burgundy suede. The card is floated above the suede background, and the photograph is recessed, making the piece three-dimensional. A silver engraved plate gives the dates of Taft's life and his service as both President and Chief Justice. The piece is finished with a silver and black frame. © 2005 History In Ink, L.L.C.